" Begin the millennium in Naples, between barrels and fireworks lighting up the sky. About 110 spaces, 300 people, the Castagnaro Parking was packed, so much fun and a great desire to stay together. This was a good occasion to get to know this wonderful city, beautiful for its works of art and so suggestive for its districts…. Once again, the friendliness and helpfulness of Castagnaro’s owner were able to make the participant, feel at their ease, like at home, helping them in small problems too. 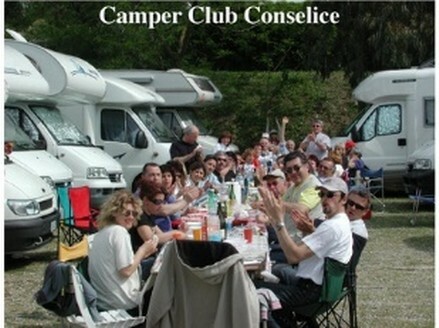 "Welcome to Castagnaro parking dear camper". Enjoy your holiday in a place which offers peace, serenity, happiness and Neapolitan beauties and kindness. 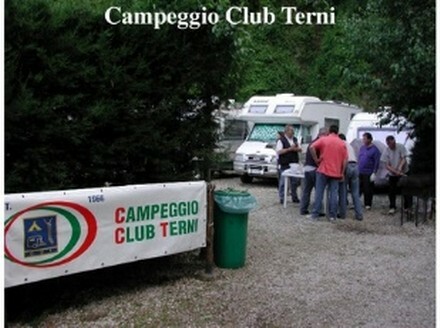 Federcampeggio. Wherever you are, stay with us, here Federcampeggio members can get professionalism, honesty and reliability while Naples and Pozzuoli give you the rest: the best! WE HAVE BEEN TO NAPLES AND ITS SURROUNDINGS. Saturday night we were all at Castagnaro Parking where we stayed for three days. At 3 PM this great gathering was officially opened with the first stop at Solfatara, landmark of a great scenic impact with its vapors and smells of sulfur coming out of the ground. 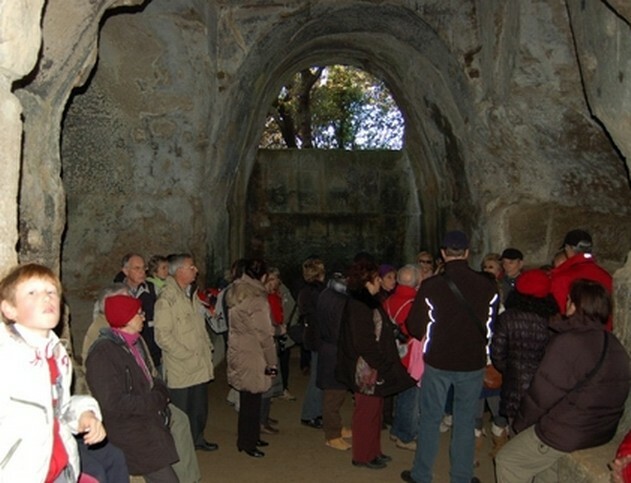 Then we went on to Pozzuoli, and stopped at Flavian Amphitheater and visited the Temple of Serapis. On this occasion, we had the first contact with our guide, a young man at first appearance very diffident, but after some time, we found him very well-trained as well as nice. At dinner, that evening, we could not miss the classic pizza. On Saturday morning, we literally dived into the Neapolitan chaos, and were overwhelmed by the Christmas atmosphere of Spaccanapoli and by the visits to the most important monuments in that area. In the afternoon, we travelled around before reaching Posillipo with its breathtaking view of the Gulf of Naples. At 6 PM we arrived at Castagnaro Parking and, after a rest and time to refresh, at 8 PM we returned to Piazza del Plebiscito to go to visit "NAPLES UNDERGROUND"…..FABULOUS!! below the characteristic streets of the Historic Centre of Naples: this one visit was worth the whole trip. We were accompanied by a guide in charge of this place, a true Neapolitan caricature that reminded me of the actor Nino Taranto. We descended 40 m. underground, walking in the old aqueducts of Naples which later were used as tufa quarries for the construction of the city and later on, during the war, as bomb shelters. We walked through labyrinths and mazes in a really striking atmosphere. When we came back, we took a breath of the cold night air of Naples, as we were all imbued with excitement for what we had seen and enjoyed, but the night was not over yet: the Gran Caffè Gambrinus was waiting for us with a real coffee. Finally, we went to bed. 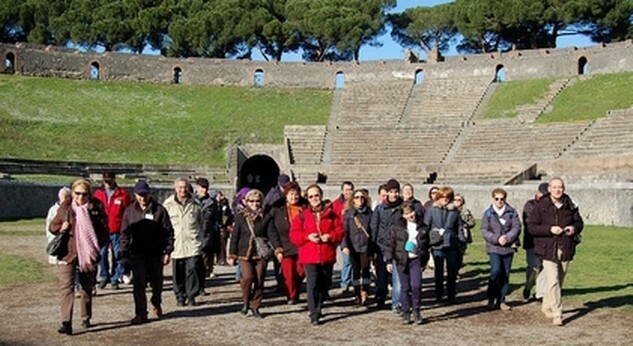 On the Monday morning, we visited another extraordinary place: ERCOLANO. No words can express what this place is. The usual guide took us into another dimension, maybe also thanks to buildings which were still undamaged. 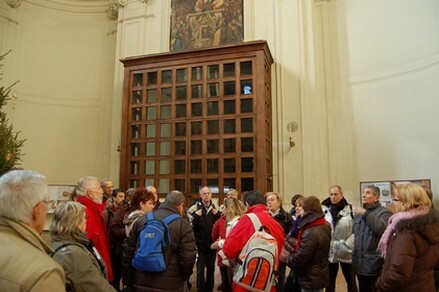 Then we returned to Castagnaro Parking with the same coach that took us around and so this wonderful meeting finished. To all participants in the New Year Meeting in the Gulf of Naples. At the conclusion of this meeting which I thought was really well done, as co-hosts, but also on behalf of the President Mr. Ferrari, who has always been by my side from the beginning and has always supported and helped me, I’d like to thank: the weather, that has always been kind toward us, apart from the last day on the Amalfi Coast, when it seemed to be sad because it was the last day and wanted to wet us with his tears; the hospitality of Castagnaro Parking, especially for being able to do everything planned. All of you have expressed so much satisfaction but I’d like to share this success with the beautiful land that we visited, so special and cozy, with its stunning art jewels, with beautiful and prepared Miss Gioconda, who was our guide the whole time, Miss Daniela, our legendary companion on the Amalfi Coast, Mr. Salvatore and Mr. Michele Quaranta of LAES, our kind and expert drivers, who accompanied us with their particular Neapolitan spirit in discovering Naples underground, but above all with the wonderful group of people who made ​​us feel part of a great family, from the youngest to the oldest. I believe that many of you felt a great silence inside after leaving the group and thought to the past with longing regret.